I have a LONG 2610 with a LONG loader. It broke in two while cleaning a feence row . the tractor was in low 1st running 1800 rpm. LONG called this customer abbuse, is any one else out there had this problem. Hello Ed, sorry to hear that your tractor is broken. To establish my credentials up front, I don't have a Long tractor, am notfamiliar with them except generically, and am not a dealer. What I am is a hobbyist and owner of a few different tractors. I think that most people would agree that I am qualified to talk about stresses and loader designs. BTW, take all the information you get with the grain of salt. For all you know, I'm a 12 year old with an attitude. From your description of the problem several things are not clear to me. For one, I don't know if you even had a loader onthis tractor. You don't say so. What are cutover tree tops? Why would you push them to clear a fence row? What do you pushing them with? A loader bucket? The front of the tractor? A blade? I live out West and these are not common terms in myarea. In fact, I've never heard of them. Tractors sometimes do break in half. Did yours just crack? or break and fall to the ground? The cause is usually thought tobe mounting a loader that has an incomplete (half) subframe or none at all. A complete subframe goes from the front of the tractorall the way to the rear axle. The loader arms are mounted to this subframe; not to the tractor. I have never seen a tractor with acomplete loader subframe break in half. But I have seen tractors of several makes with a half subframe break - as well as onesthat have used a three-point mounted backhoe without the lift-arm stabilizer. Most of these were overloaded. Like most mechanica-type guys, I have wondered about the quality of castings from third-world manufacturers. If you suspecta flawed casting, you might consider taking the pieces to a metallurgical testing lab. Most cities of 100K with an industrialmanufacturing area will have one. Well it has happened. I have posted on this subject before advising owners that farm tractors with loaders are not bulldozers. 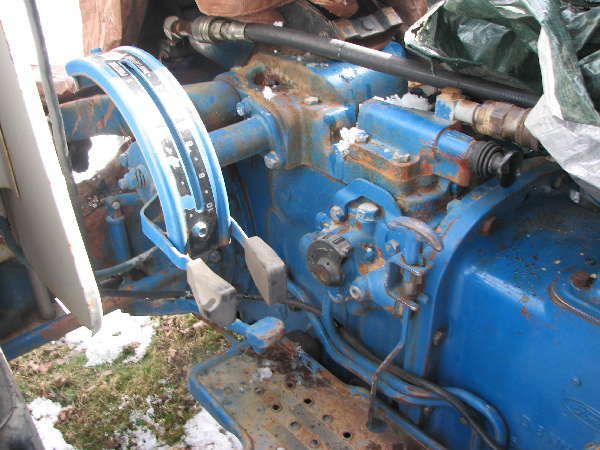 I am a tractor dealer and prior to that I was an engineer for twelve years. I have seen other tractors break in half before. It can happen, to any brand. You loaded you tractor the worst way possible. You had a large load on the front of the tractor (loader) and a large load on the rear of the tractor (bush hog) The tractor was trying to flex in the middle due to the large overhanging loads on each end of the tractor. As you discovered cast iron doesn't flex, it breaks (fractures in engineering terms). Most industrial and purpose built loader tractors, true backhoes, all have an external steel frame around the castings. There is a reason for this, but this beefing up cost money. I tend to agree the tractor was used beyond its design capacity. 1) yes i had a front loader with a bucket on it.2) cutover is land that has been logged, the limbs and tree tops are left after cuting the timber.The fence row is were I am going to build a fence along side of my road and its in the edge of this cutover. Some of the tree tops and limbs had falled in the way and had to be pushed back. This is dry wood and is not real large.3)Broke in two peices, not cracked, it's a half frame mount.